Giovanni Fattori, Haystacks (date unknown), oil on canvas, dimensions unknown, Location unknown. WikiArt. Initially apprenticed to a local painter in Livorno, Fattori was sent by his father to Florence to study art in 1846. Once there he enrolled in the Academy of Fine Arts. He engaged in various liberal and progressive groups there, including what were at first informal contacts with the Macchiaioli in the Caffè Michelangiolo. Between 1848 and 1850 he was active in politics back in his home town of Livorno, returning to Florence to complete his studies. There he played an early and active role in the original small group of Macchiaioli, joining properly in about 1859. 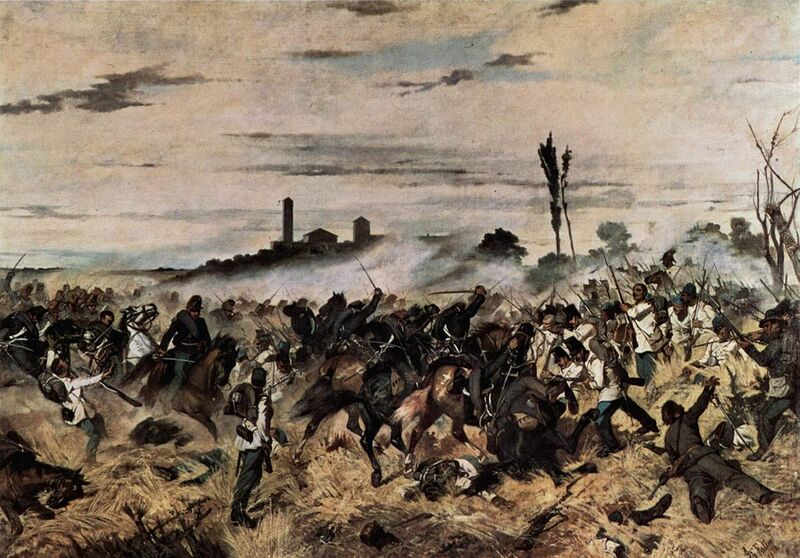 With the encouragement of other members of the group, he started to paint military and battle scenes from the Risorgimento, the uprisings aimed to unify the state of Italy, and had early success in exhibition with a portrayal of the Battle of Magenta. Giovanni Fattori, Storming of the Madonna della Scoperta (1862), oil on canvas, 204 x 290 cm, Museo Civico Giovanni Fattori, Livorno. WikiArt. 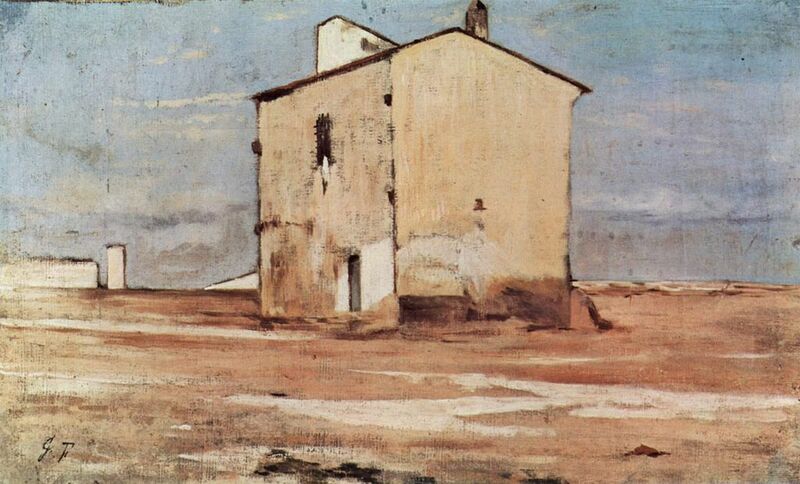 In 1867, after the early death of his wife from tuberculosis, he lived on Martelli’s estate at Castiglioncello, painting plein air with Borrani, Sernesi, and Abbati. He also continued to paint battle scenes in the studio. 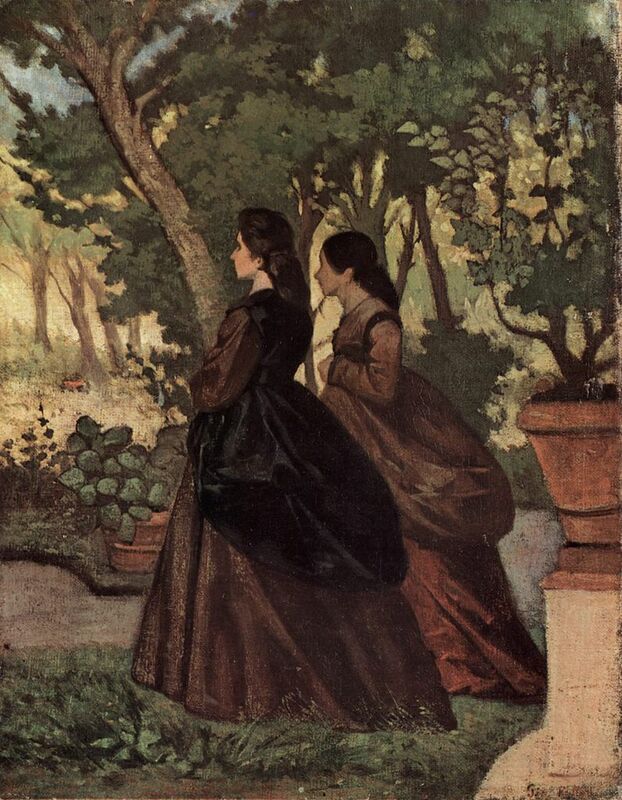 Giovanni Fattori, Two Women in the Garden of Castiglioncello (1864-5), oil on canvas, 34 x 26.5 cm, Private collection. WikiArt. Giovanni Fattori, The Rotonda at Palmieri (1866), oil on panel, 12 x 35 cm, Galleria d’Arte Moderna di Palazzo Pitti, Florence. WikiArt. His plein air paintings are characteristic of the Macchiaioli: using relatively small panoramic wood panels, he painted in macchia (taches or patches), in a style which was not dissimilar to that of the Barbizon School in France. In general these small paintings lacked the high chroma or exploration of light which later became so characteristic of Impressionism. Giovanni Fattori, Portrait of Silvestro Lega, Painting Beside the Sea (1866-7), oil on panel, 12.5 x 28 cm, Private collection. WikiArt. 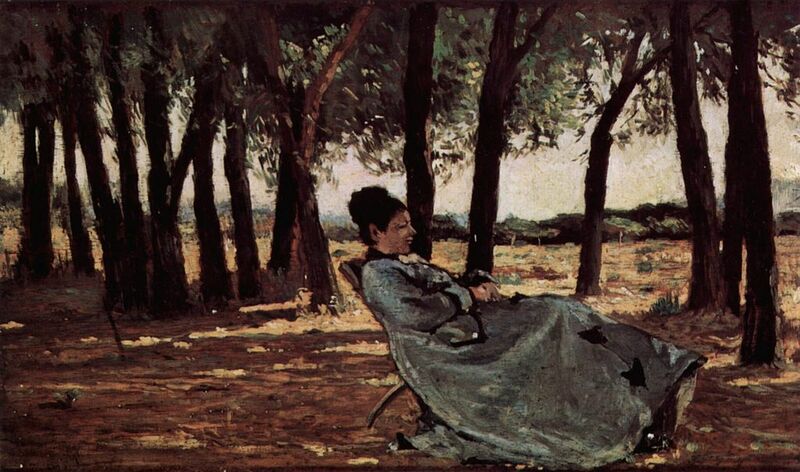 Giovanni Fattori, Signora Martelli at Castiglioncello (1867), oil on panel, 20 x 35 cm, Museo Civico Giovanni Fattori, Livorno. WikiArt. Giovanni Fattori, The Knacker’s Yard in Livorno (1867), oil on cardboard, 25 x 38 cm, Private collection. WikiArt. Recognising his influence if not dominance among the Macchiaioli, he was appointed Professor in Florence in 1869. He then went to Paris in 1875, where he found greatest appeal in the paintings of Manet and Corot. He returned to paint and teach in Florence. 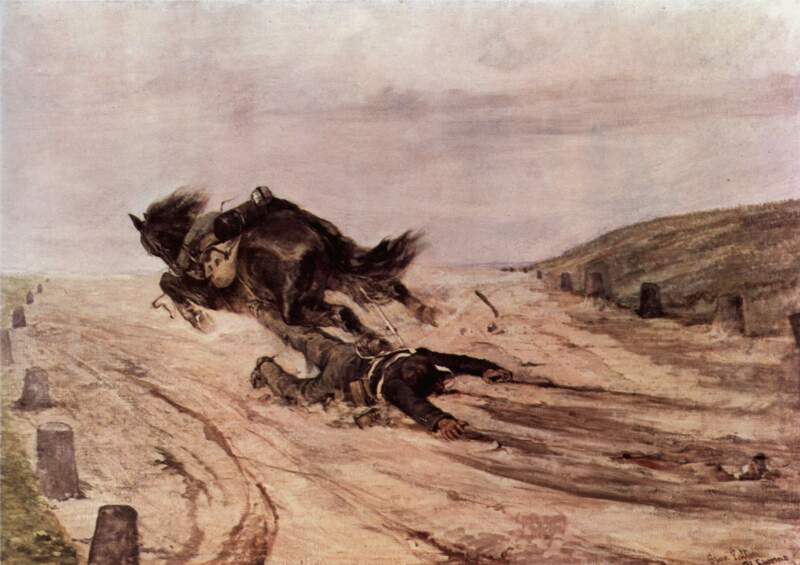 However his battle scenes and paintings of horses and cattle in rural settings were not commercially successful, and by the end of the 1870s he had lapsed into poverty. Giovanni Fattori, Dismounted Cavalryman (1880), oil on canvas, 90 x 130 cm, Galleria d’Arte Moderna di Palazzo Pitti, Florence. Wikimedia Commons. After 1884 he concentrated on etching, and the few paintings which remain of this period continue earlier rural themes with horses and cattle. 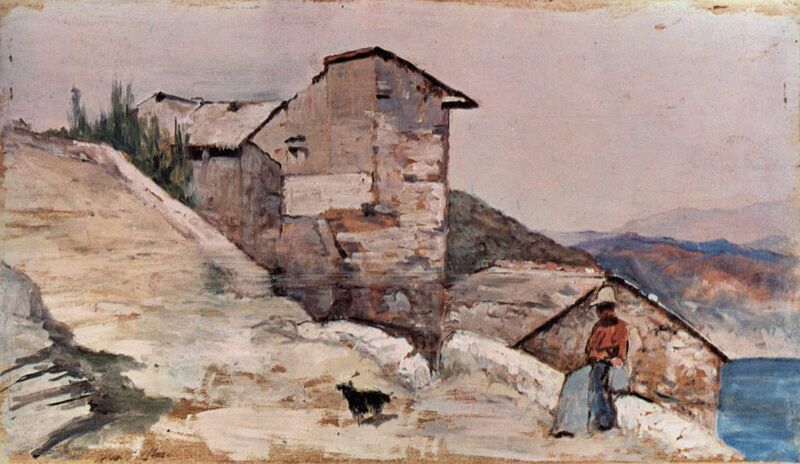 Giovanni Fattori, Homestead in the Hills (1880-90), oil on panel, 19 x 33 cm, Galleria d’Arte Moderna di Palazzo Pitti, Florence. WikiArt. As he aged, he grew more fixed in his artistic outlook, opposing change, but still exhibited in the National Exposition in Venice in 1887. In 1891 he became a vociferous opponent of Divisionism. As his poverty continued, he also grew more embittered about life. 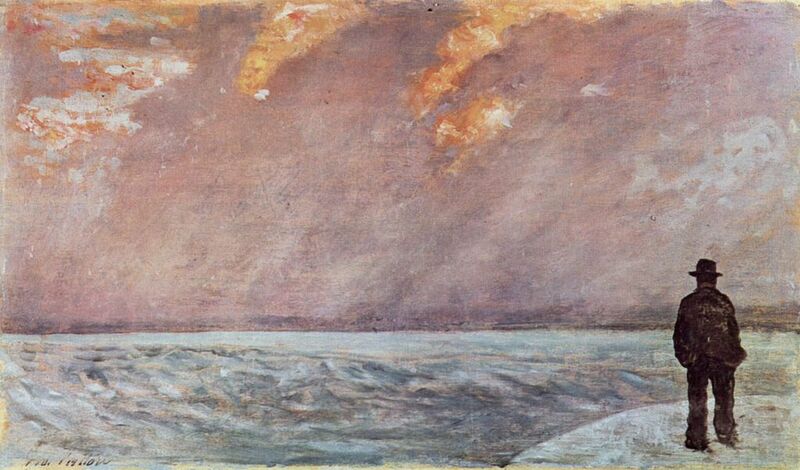 Giovanni Fattori, Sunset over the Sea (c 1895-1900), oil on panel, 19 x 33 cm, Galleria d’Arte Moderna di Palazzo Pitti, Florence. WikiArt. 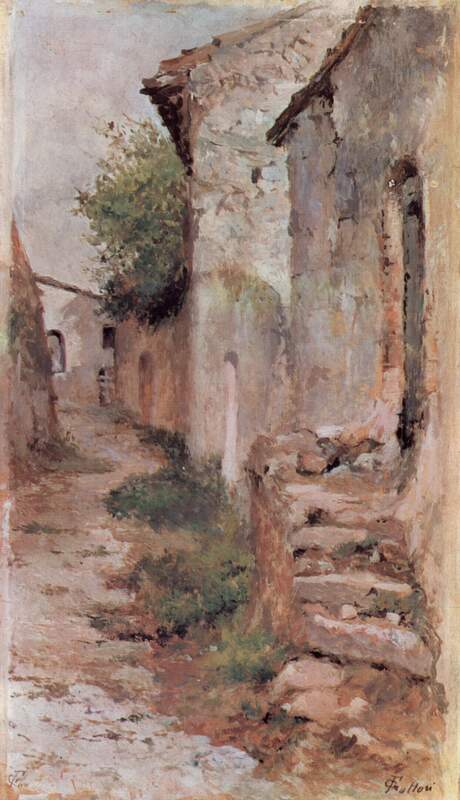 Giovanni Fattori, Village Road (1903-4), oil on wood, 24 x 14 cm, Galleria d’Arte Moderna di Palazzo Pitti, Florence. Wikimedia Commons. He painted until shortly before his death in 1908. Already at that time his works had lost popularity, being viewed as outmoded by comparison with other contemporary work. They are now seldom seen outside his home town of Livorno, or Florence as the focus of the Macchiaioli. Of the more prolific and influential members of the Macchiaioli, Fattori was the only one to adhere to the group’s principles throughout his career, at cost to his income and recognition. As a result he provides us with the best view of the Macchiaioli style, in which plein air sketches were made on small wood panels using their characteristic macchia, but larger ‘finished’ works were then produced in the studio. Anyone who wants to see unadulterated and pure Macchiaioli paintings should beat a path to his museum in Livorno, and to the Palazzo Pitti in Florence. Posted in Painting and tagged Corot, Divisionism, Fattori, Impressionism, Italy, Macchiaioli, Manet, painting, Risorgimento. Bookmark the permalink.